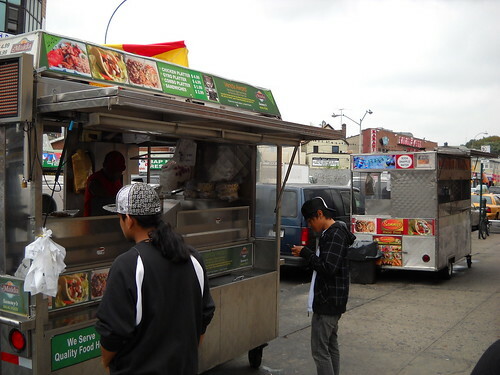 Having never really been to Queens before, we took a tour through the neighborhoods, focusing more on eating street food, should-be-street food, stands, shops and casual joints rather than sit-down establishments. I compiled a lengthy listing of possible stops—more a collection of options rather than a checklist, and went from there. 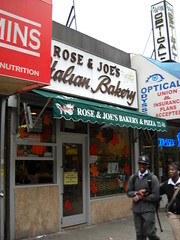 Heading upstream through a sea of middle school kids pouring out of class, we made our first stop at Rose and Joe’s Bakery & Pizza. They didn’t want us to take pictures—but frankly, it wasn’t really worth the space on our memory card anyway. 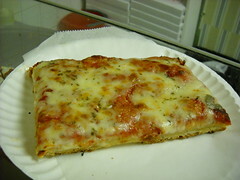 We had a Sicilian slice, which was just fine. 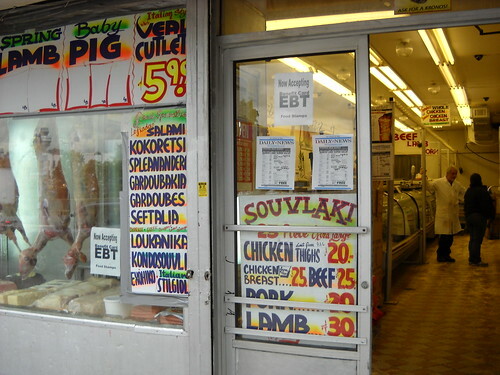 We saw plenty of Greek butcher shops like this, who in a addition to having whole baby lambs, pigs and goats on display, advertise more exotic meat creations like kokoretsi (offal stuffed intestines), kondosouvli (giant pork souvlaki) and s(h)eftalia (offal sausage wrapped in caul fat). 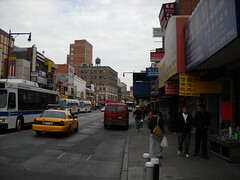 We walked up 31st to Ditmars and into the Little Egypt neighborhood. Hookah bars, coffee shops, halal butchers, and merguez. Little Morocco was first—it’s been written up in the NYT and Serious Eats in the past couple of years—it was good. Crispy roll, subtly spiced sausage, and a fresh cold salad on top. A lovely snack, eaten outside a very sleepy restaurant on an unseasonably warm afternoon. Halal Sandwich shop was much different—packed with customers, carry out orders being rushed out to a waiting bicycle (free delivery! ), grilled meat smells and sounds. 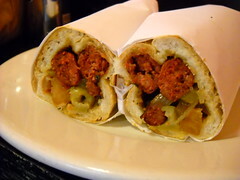 Their merguez sandwich was an extension of that first impression—highly spiced, juicy merguez on what seemed to be the same crispy-soft roll that Little Morocco used. The crumb soaks in the juices, while the crisp outside keeps it contained in a tight package. The warm olive salad was the perfect condiment. 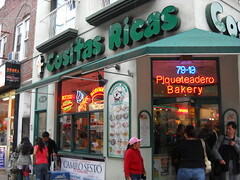 In honor of Peter Engler, next stop was San Antonio Bakery, home of the Chilean hot dog (The Revolutionary). The owner was very excited about his hot dog. 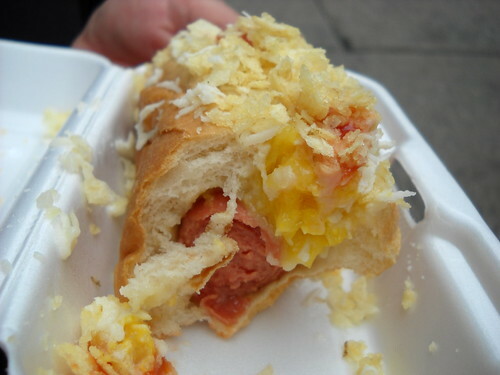 He had heard of the Sonoran-style hot dog and seemed somehow graciously dismissive of the Mexican variation. He was proud of his hot dog, and I understand why. It was lovingly prepared. As messy as it became, it began very tidy. 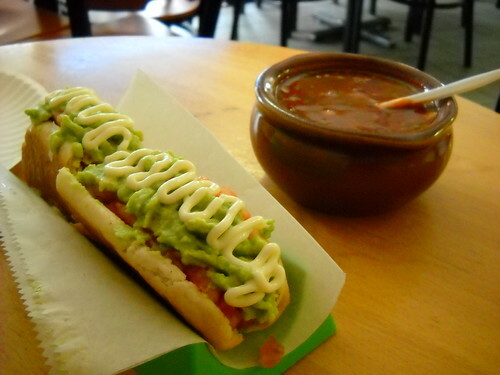 It was a standard hot dog topped with mashed avocado, chopped tomato and mayo—also tucked in there was a little lightly pickled cabbage. The bun, however, was what made it! It was a bakery, after all and the bun was a little crisp on the outside, giving way to a dense, slightly sweet rich crumb. Lovely! The crock of salsa on the side tasted to me like one part Pace Picante Sauce and one part ketchup. Not for me, but who am I. 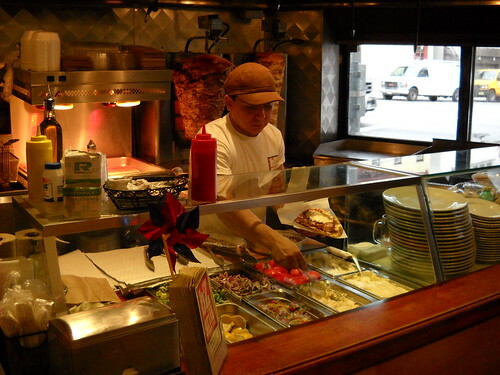 Next stop was BZ Grill for gyros. It’s a lovely shop—a modern take, without being cloying or annoying! 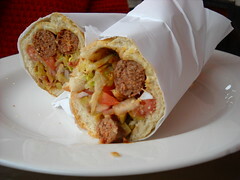 ...but there were a lot of other interesting choices on the menu like haloumi, seftalia and brizolaki sandwiches. And their basic items are dressed up a little, without becoming too precious. For instance, the “lettuce salad” comes dressed with lemon, dill, olives and scallions. BZ Grill | 27-02 Astoria Blvd. 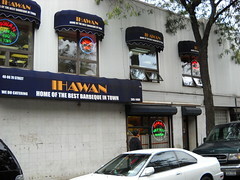 On our walk back to the hotel, we saw this storefront, which further endeared us to the Queens. 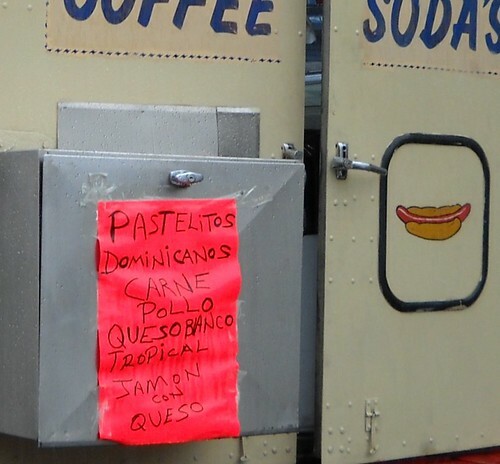 More evidence of a rich, and changing street food culture. 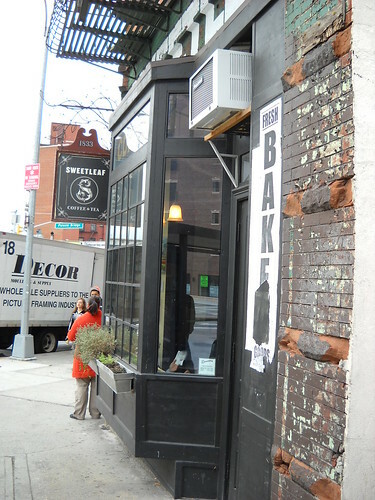 On our way out to Flushing, we stopped first at Sweetleaf Coffee in the heart of Long Island City. What a great coffee shop!They use Stumptown Coffee and prepare it well. Bee-line to Nan Xiang. Pigmon already posted about our experience here, but if you’re not inclined to click the link, let’s just say that the XLB lived up to the hype. 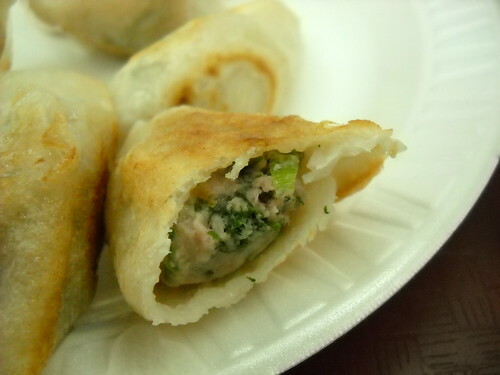 If you are looking for The Dumpling, skip Joe’s and New Green Bo, and come directly to Nan Xiang. 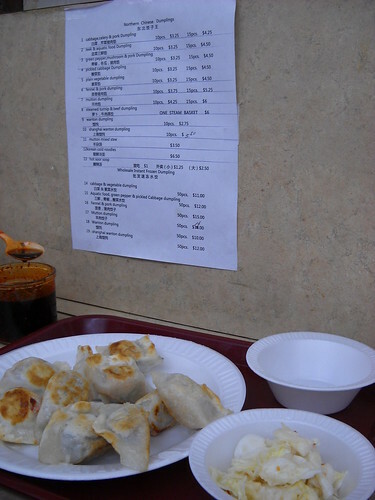 After we left Nan Xiang we had the fever for the flavor—more dumplings. These were just-made, fresh pork wontons doused in a healthy dose of Szechuan pepper corn, garlic, scallion, chile oil, and chopped pickled vegetable. The mild, almost sweet wonton took particularly well to the fiery, salty sauce. Best Northern Dumpling is in a sort of random open market housing an array of herbs, tea, nuts, noodles, rice and mushrooms. The other food stalls in the back were closed for the day, if not for longer. Snooze, right? Thankfully, not—they were simple and near perfect. The filling was pork and what they were calling Chinese fennel—but it tasted like strong dill. Together with the housemade spicy dipping sauce and the quick pickled cabbage, they made a great snack—and the dumplings were much juicier than they appear in the photo. The language barrier may have been an issue here if it wasn’t for this bemused child who not only served as our translator, but dumpling assistant too. After finding out that Corner 28 (40-28 Main St) was out of duck skin buns, we descended into the subterranean food stall market, Golden Mall. It wasn’t very large, but it is cavernous and crowded—a complete sensory overload. We went on a Friday afternoon and it was bustling but navigable—I can’t imagine setting foot down there on a weekend. We decided on Xi’an Famous Foods for some liang pi (cold skin noodles) and zi ran chao yang rou jia mo (spicy lamb pocket). Both of these items have been written about extensively. More hype realizing its potential. 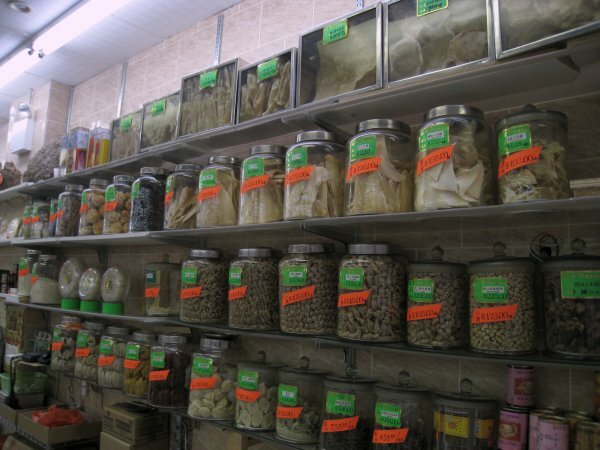 You could spend a long time down there in that magic cavern eating your way through countless Northern Chinese specialties like, hand-pulled noodles, Chinese headcheese, chive pies, hot pot, regional sausages, etc. Kathryn Yu has spent a lot of time documenting the mall, and this blogger (Food Enthusiast) has taken of liberty of mapping out the stall floorplan. Bitter greens with dried bean curd – just what we needed at that point. On our way to Manducati's Rustica, a newish out post of the long standing Manducati’s, we happened by a small wine shop, which turned out to be the highlight of the evening. 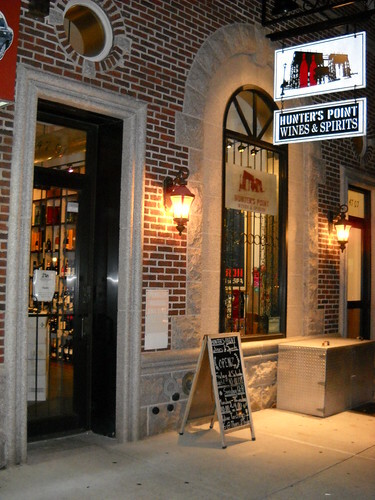 Inside was a carefully curated collection of wines and spirits, and an engaged and excited shop owner who was ready to tell you about each and every one. --but it was mishandled. Long story short, we waited for an inordinate amount of time for our pizza to arrive. We were told that they ran out of wood, and the fire wasn’t burning hot enough. Apparently this must have been true because the slabs of buffalo mozzarella were refrigerator-cold in the center and only slightly melty on the outside. Everything was else was boring, including a crust which was both flabby and bitter crisp at the same time. When the folks next to us received their food (pastas and entrees), they each took one bite and walked out. A sucker for redemption, I went for some of the house made gelati on the way out. My fior di latte gelato was grainy and sticky sweet. At least the wine was good. Starting with a little grilled cured beef and rice (beef tapa). It was our first stop, and we wanted just a taste of something. I would definitely go back to eat a proper meal here. At first I got a very stand-offish vibe, like I was in their way. And then I realized, I was in their way. I wonder if the massive trays of beautiful banquet food being rushed out the door and the strained facial expressions on the men carrying them were because they were in mourning. Typhoon Ketsana had ravaged the Phillippines the week before, and I’m sure that Ihawan was providing catering for satellite vigils and family gatherings. 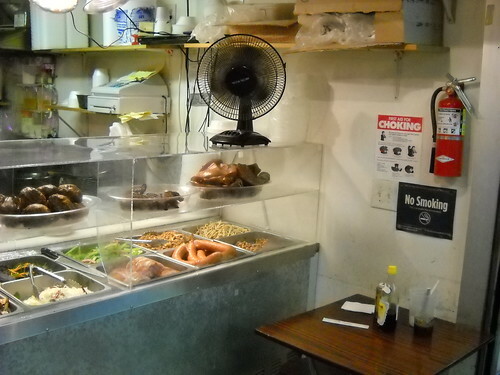 Next stop was the beyond famous, Sammy’s Halal for chicken rice. On the corner of 73rd and Broadway (just block north of Roosevelt), there are three or four street carts competing for business. 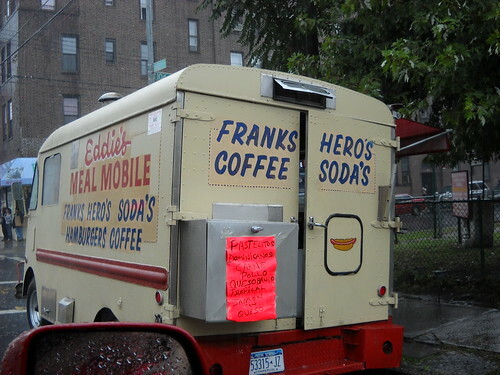 Looking at this picture, I’m having a hard time remembering which cart was the “real” Sammy’s. Both carts are called Sammy’s, although I think I remember reading about a mentor-protégé relationship, so maybe they are related in more meaningful ways than our Steak and Lemonade joints are. Oh, and the carts we’re spotless—miraculously so. Juicy chicken and dry (in a good way) rice, grilled onions, herbs and the trifecta of sauces, spicy-herbal-creamy. Even the iceberg adds to the dish. Everything tasted so incredibly fresh. A! I suppose Sammy’s could be considered the first stop on a micro-tour of Little India—shops and restaurants from all of South Asia in a very compact area. We were just a few days early for the Dawali Mela street festival, which I’m sure would have been a blast. 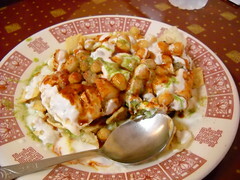 Not quite ready for dessert, we opted for a samosa chaat over sweets at Maharaja Sweets. This may have been for first samosa chaat I’ve ever had, so I’m certainly not a good judge, but this was flavorful, if a bit cold. I imagine there is a lot of room for interpretation in this dish, and I liked this version just fine. It was all fine—above average even. 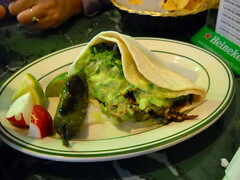 Especially the al pastor taco, which was very juicy-fatty and crispy edged. 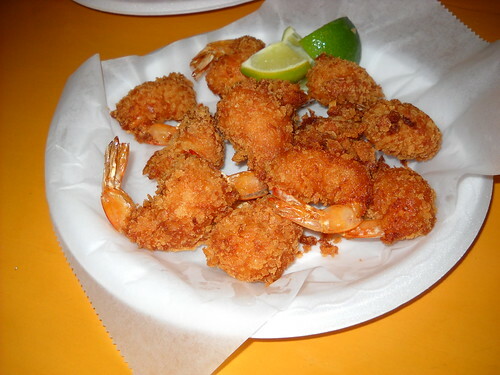 On our way to have some Korean-Peruvian fried fish, we couldn’t help it. Another fist pump in the direction of Peter Engler, we stopped in at Los Chuzos y Algo Mas for a Columbian hot dog and an alfalfa shake. The alfalfa-pina shake was delicious—though Josephine was skeptical when she saw them adding alfalfa sprouts to the blender, as opposed to alfalfa-alfalfa. Light, sweet, and only slightly vegetal. 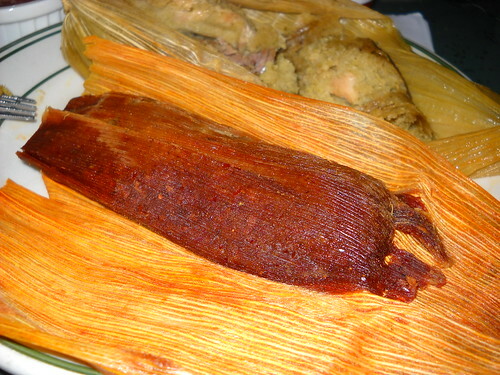 In hindsight, we probably should have gone with a chuzo, but stomach space at this point was at a premium, and sometimes it’s not just about the food. 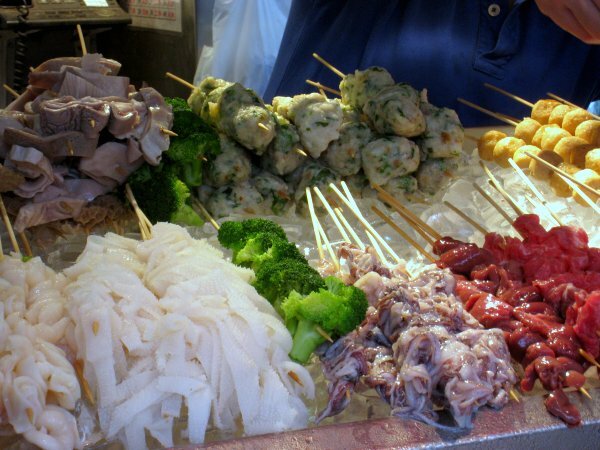 Chuzos, by the way, are Columbia’s (and other South American country’s) contribution to the global, grilled meat on a stick family—cousins to yakitori, satay, and kebab. 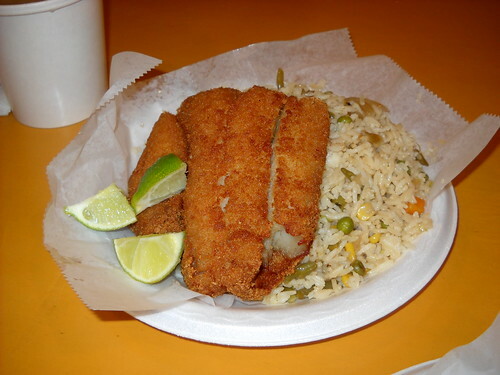 Our last stop on Roosevelt Ave, was Jose’s Fish Market—a Korean-Peruvian fried fish joint. 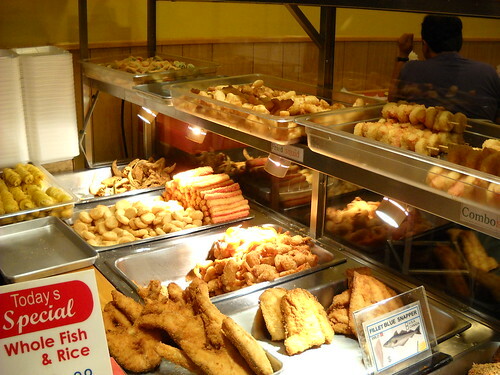 It was a little disconcerting to see all baskets of already fried fish sitting under heat lamps on the counter, but whatever double-fry system they’ve engineered, produces very crispy outsides, and perfectly cooked innards. 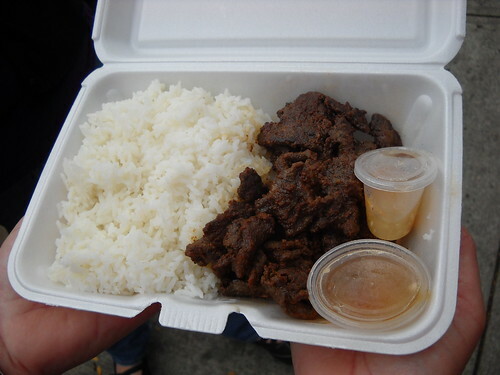 Served with either rice or chips, each plate is priced at about $5. 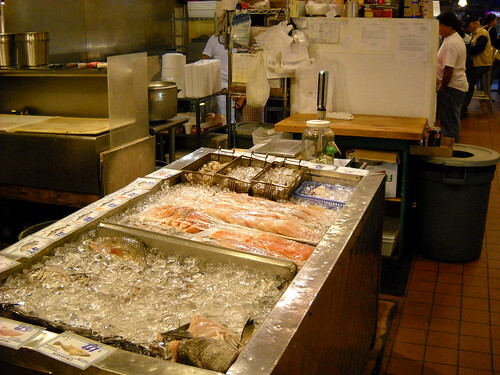 And with all the fish bones, shrimp shells and scraps—fish soup. The rain was coming down pretty hard at this point, so we jumped in Josephine’s car and headed out to Corona for some subs. 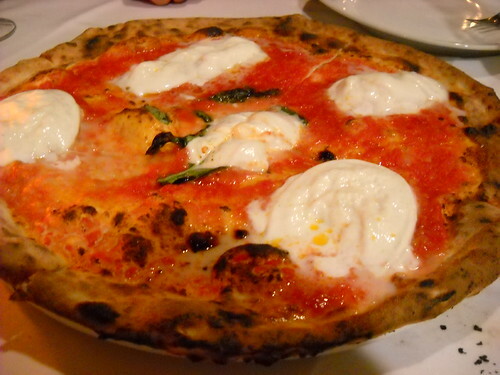 Leo’s Latticini is as old school as it comes. As the name suggests, this is a cheese making family business (ricotta and mozzarella are their specialties). The women who worked here welcomed us out of the rain and fed us Italian heros stuffed with their homemade mozzarella, and let us wash it down with beer from the fridge. 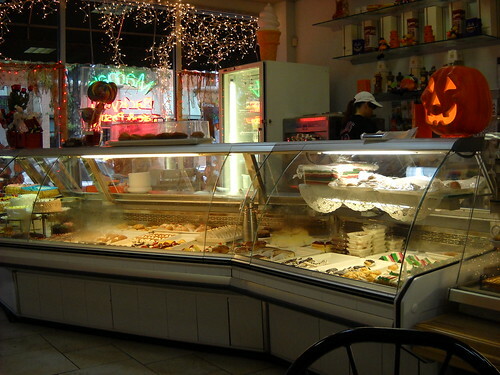 We sat next door at their bakery and admired their selection while we ate. There was room for one last meal at the Original Nick’s in Forest Hills! The pizza was good, but even better was the salad. Hearty bitter lettuces lightly dressed, which actually tasted like they were grown in the earth, instead of something that came out of a plastic bag. 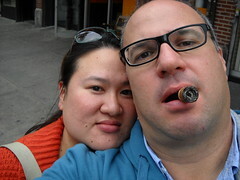 We ventured into Manhattan the following day to take a break from it all. We indulged in designer food and took in the unseasonably warm October day (gelato trucks, Central Park, pork belly buns, ramen shops, Gray’s Papaya and Mario Batali) which was all delightful, but it felt particularly good to get back to Queens. Last stop, Natural Tofu for some soon dubu. This was a whirlwind tour that covered a lot of well-trodden ground--certainly nothing under the radar. Thanks to countless bloggers, outer borough Chowhounds, Serious Eats and the Village Voice we pieced together a pretty amazing first trip to Queens. Next time we hope to be able to give something back. Last edited by trixie-pea on January 24th, 2010, 1:52 pm, edited 1 time in total. You're making me very homesick... I grew up in Jackson Heights, before the days of all that great food, when the most exotic thing was the still open & still good bagel store on 37 Ave & 86th street. My first apt was on the second floor directly above Nick's which was then a shoe repair store and a second hand store pretending it sold antiques. The best food at that intersection was Baskin-Robbins. 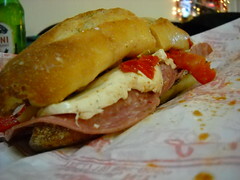 Anne - just curious, when did your old neighborhood shift to this interesting food destination? Trixie - very nicely documented post on your trip. I'm sure you have inspired many to follow someday in your footsteps. Incredibly motivating post, I feel an actual physical pull drawing me to Queens. 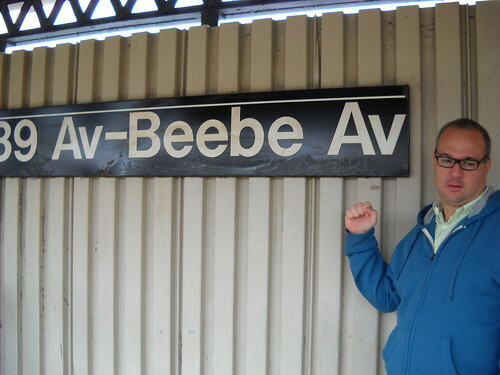 Armed with some of the same info as trixie-pea and PIGMON (including some of their carefully gathered intel), I also made an October trip to Queens. 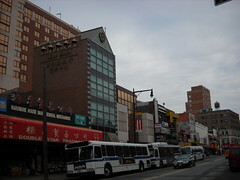 Specifically for Flushing and the "real" Chinatown. I had to chuckle, not because it isn't true (it is), but because my first thought was, "But did you see that mall?!" Definitely a wormhole straight to somewhere else. 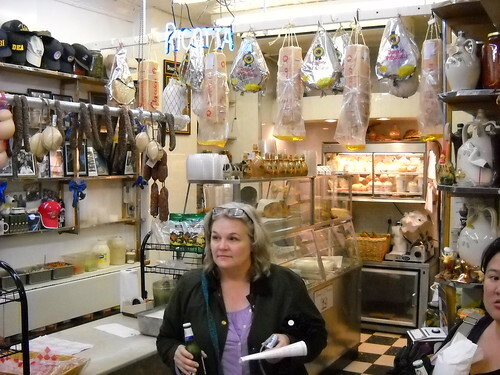 My companions asked incredulously, whether Chinese food really featured sandwiches, and with lamb! But it tasted oh so right. 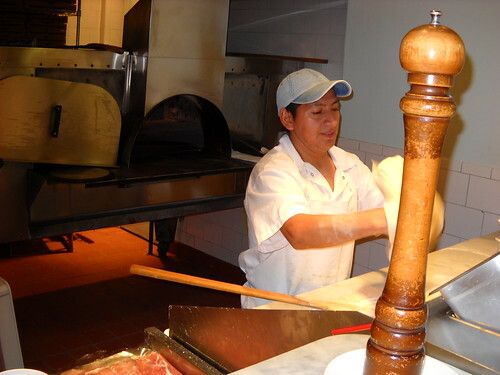 And sitting at the stand, you have a ready entertainment of any number of people making noodles by hand. Was Corner 28 the shop with the window selling the duck buns? 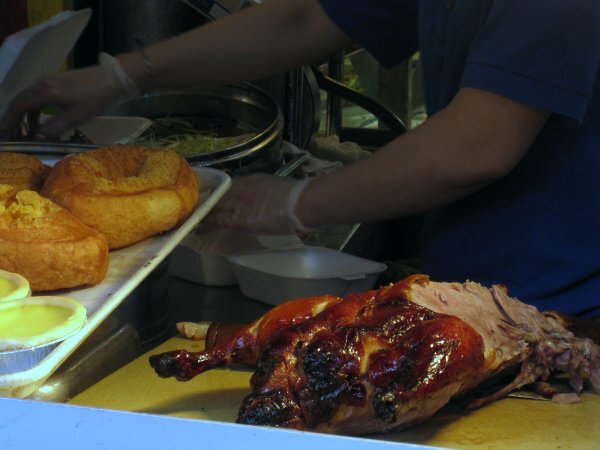 We spent what seemed like an eternity watching the man meticulously slice up the duck before they started taking bun-orders. If they were out when you stopped in, it might just have been a 5-10 minute (feels like forever) wait before they had more. Would that they had such a stand here. Right next to the duck bun stand was a skewer-grill operation that looked very intriguing, but the duck buns were the straw and we were broken camels. We only explored a fraction of what seems like the unbelievable day of eating that you did. But I must concur, Queens has got it all going on. Thanks for your marathon travelogue and inspiration for future exploration! 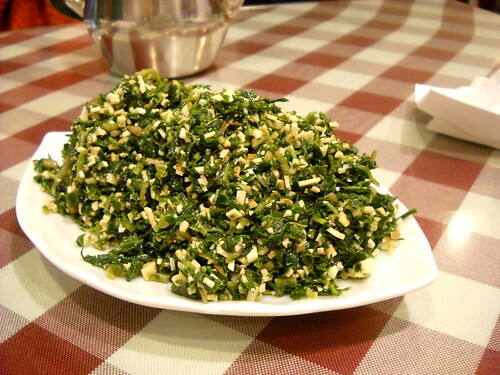 gastro gnome wrote: I agree that Nan Xian is very good, although I scalded my tongue which impacted tasting for a bit. There was a Chinese gentleman sitting behind me who had a very interesting technique for eating these particularly juicy buns. After getting scalded and squirted in the face with his first dumpling, he decided to poke a hole in the 2nd one with his chopstick, and let the juice run out onto a small plate. Then he drank the soup from the plate in a decidedly goopish manner. Then to be on the safe side, he ate the dumpling with his knife and fork. Me, I place the dumpling on a soup spoon, and bite a wee hole at the top, sprinkle in a drop or two of black vinegar and a shard of ginger, then sip the soup down to a manageable quantity. Then pop the whole thing in. 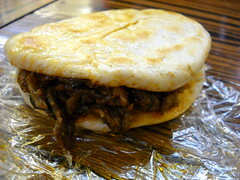 gastro gnome wrote: Was Corner 28 the shop with the window selling the duck buns? Exactly the place. We got shooed away before we could even utter the words, duck bun. She read our mind, and told us no more, come back tomorrow. Last edited by trixie-pea on January 24th, 2010, 2:40 pm, edited 1 time in total. AnneK wrote: You're making me very homesick... I grew up in Jackson Heights, before the days of all that great food, when the most exotic thing was the still open & still good bagel store on 37 Ave & 86th street. 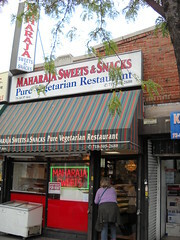 It's hard to imagine a Jackson Heights without the great food. The sheer number of restaurants hailing from so many different countries make it feel like the neighborhood has been that way for a long, long time. Time to get back for a visit! As always, a wonderful post in scope and feel. Thanks very much to all the New York adventurers for getting me through what would otherwise have been a very boring Sunday of Daube-making and trying to avoid the football on TV. 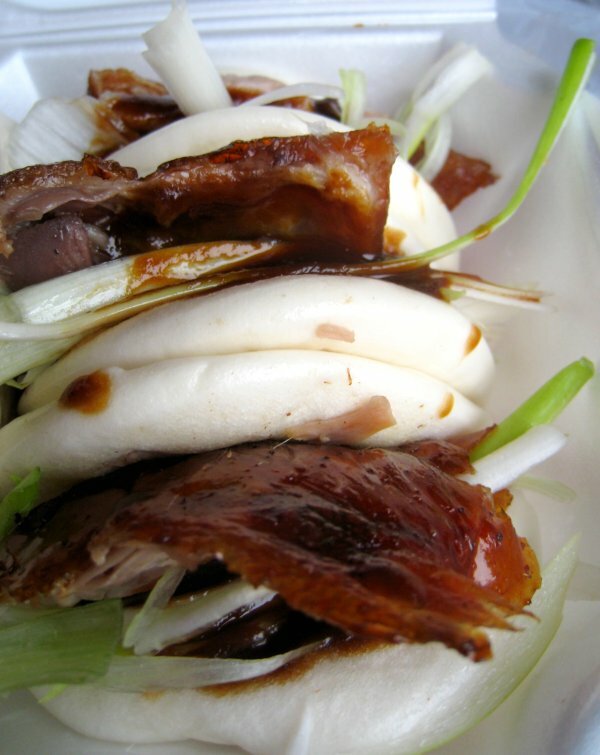 Lovely, and I want a duck bun right NOW! We may have to go to Sun Wah very soon to put a band-aid on that desire. Phenomenally informative and delectable post, Trix. I'll bet it took longer to create than the actual weekend it documents, so thanks, for taking the time share it with us here. What a wonderful and inspiring post! 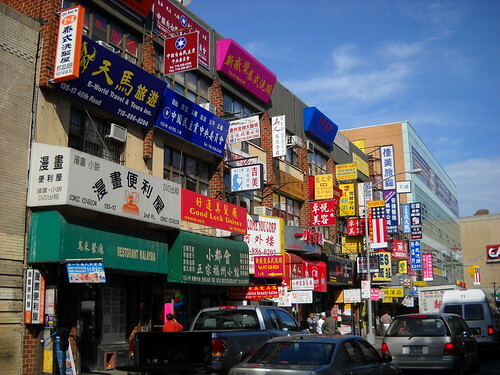 I've been to Nan Xiang and a couple of other neighborhood places in Queens but, in the eighteen months I've been in NYC, most of it remains unexplored territory. With P and TP's guidance, it won't be any longer. Thanks again. Tremendous post. 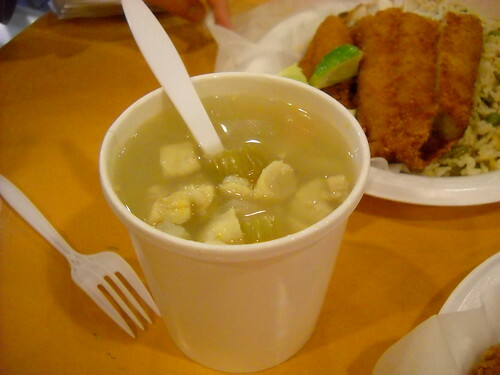 As I mentioned to PIGMON, I ate my way around Astoria, Jackson Heights and parts of Brooklyn in late October. Despite having great food in Queens, I didn't overlap at all with PIGMON's and Trixie's path. That's a testament to Queens' food scene and to those 2 intrepid eaters. In my experience, Queens is where it's at. Chicagoans visiting those 'hoods in Queens will feel very much at home, if home in Chicago is Albany Park, Uptown, or La Villita. Great diversity, a vibrant street scene, and an L rumbling overhead. 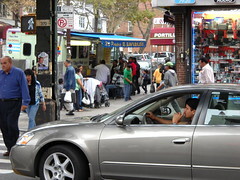 As an aside, I want to observe that many good people in Manhattan, food-savvy native NYers even, astonishingly still have little or no knowledge or interest about what's in Queens these days -- despite the fact that a fast subway train will have you in Astoria from Midtown in significantly less time than it takes to ride the Brown Line to Kedzie from the Loop. They will go to the immediate vicinity to watch tennis and baseball, or to catch a flight. But stop to eat? No. I can nearly understand how my good friends from Santa Monica, the Palisades and Pasadena (natives all) have never heard of Langer's, never set foot in Thai Town or Little Armenia (they have been through on the way to house parties at Loz Feliz or hipster spots in Silver Lake and don't know it), but the NY thing puzzles me. I guess it's a Manhattan malady more than a NY issue. Maybe Chicagoans are just as clueless. Maybe I just hang around a different kind of eater here. JeffB wrote: Tremendous post. 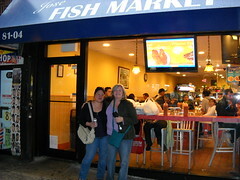 As I mentioned to PIGMON, I ate my way around Astoria, Jackson Heights and parts of Brooklyn in late October. Despite having great food in Queens, I didn't overlap at all with PIGMON's and Trixie's path. That's a testament to Queens' food scene and to those 2 intrepid eaters. In my experience, Queens is where it's at. Chicagoans visiting those 'hoods in Queens will feel very much at home, if home in Chicago is Albany Park, Uptown, or La Villita. Great diversity, a vibrant street scene, and an L rumbling overhead. LOL. I know plenty of people who live or have lived in Streeterville who think that Andersonville (or even Lakeview in a couple of cases) is practically Milwaukee. I'm with Josh - a vast majority of Chicagoans who live in Lincoln Park, Lakeview, River North, Streeterville and more have never been to the 4700 block of North Kedzie, have no idea what kind of food is available there, and wouldn't be interested anyway if they did know. Ditto for many other great food neighborhhods in Chicago. jesteinf wrote: LOL. I know plenty of people who live or have lived in Streeterville who think that Andersonville (or even Lakeview in a couple of cases) is practically Milwaukee. Count me among that group (well, I live in Gold Coast, but close enough). I still make the trek to Andersonville, Rogers Park & Edgewater quite a bit to hang out with friends, I just make sure my passport is up to date, the cat has a few days' worth of food & water, someone is lined up to come water the plants, and I've packed enough supplies for the journey before I head out (you know, GPS, water filtration device, a few MREs, malaria pills, etc.). 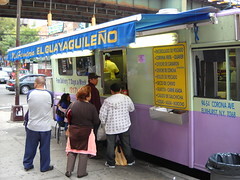 JeffB wrote: As I mentioned to PIGMON, I ate my way around Astoria, Jackson Heights and parts of Brooklyn in late October. Despite having great food in Queens, I didn't overlap at all with PIGMON's and Trixie's path. 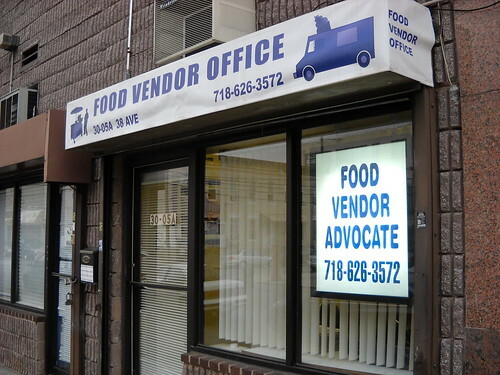 That's a testament to Queens' food scene and to those 2 intrepid eaters. In my experience, Queens is where it's at. Queens is definitely where it's at. Any Queens highlights from your recent trip worth noting? 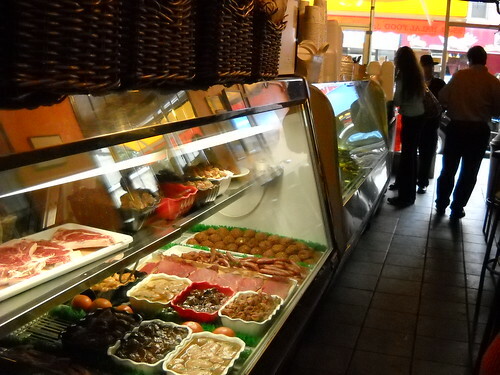 There we're definitely a ton of places that we didn't get to, that were on our list like Ben's Best Kosher Deli in Rego Park and Sripraphai. Thanks for a great post. Queens is, indeed, where it's at. 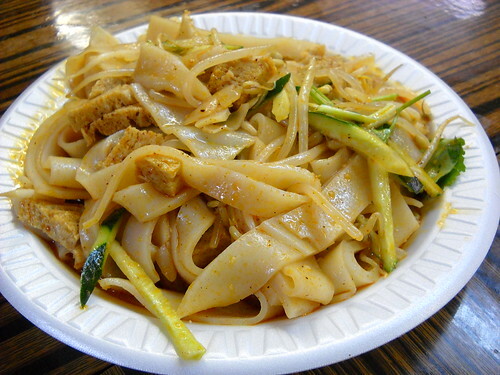 Sripraphai is fine but undistinguished compared to the best of what Chicago offers in Thai. 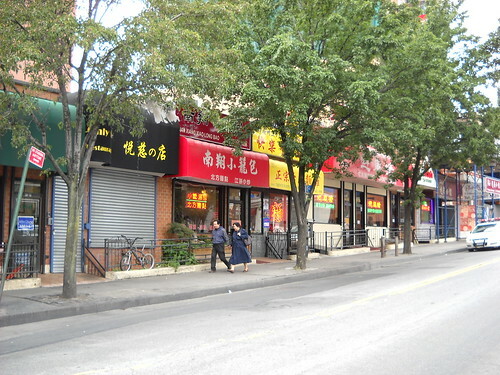 I took a break from visiting family and friends to treat myself to a day of Chinese food in Flushing yesterday. Although I had once had dinner in the area some years ago, this was my first ever day of just pure indulgence, sampling and tasting, and I really cannot express in words how much I enjoyed it. The trip was an easy enough 30-or-so minute subway ride from Manhattan, with one train switch to the "7." If you are planning on making this trek soon, note that there are some track closures due to repair work on the Flushing-bound 7 train so you might have to backtrack a couple of stops (not a big deal). After exiting the Main St. station, I immediately went to Nan Xiang Xiao Long Bao which I anticipated being the highlight of my visit. I arrived at about 11:30 a.m. expecting to find a large line. Instead, I was seated immediately (perhaps they expanded since there are two dining rooms and the one I was in looked like it might have been added by expanding next door?). The soup dumplings arrived as promised about 15-20 minutes later, freshly prepared. I don't even know what to say about the soup dumplings. They were amazing. 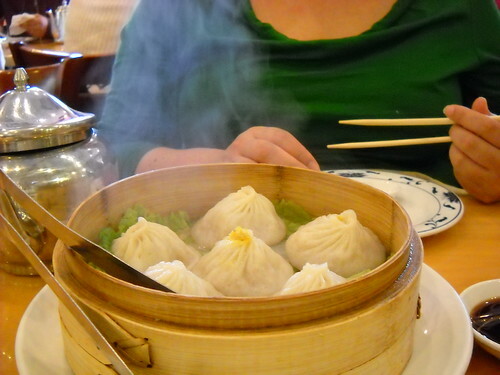 First, they were the largest soup dumplings I have ever encountered, meaning that I had to be extra careful when it came to placing the dumplings on my spoon and biting the small hole in the dumpling to drink the soup. I was a little careless with the first one (and lost a bit of soup onto my plate), but perfected my method by the second dumpling. You see, the dumplings are so large that at least part of the dumpling will hang over your large spoon, no matter how you place it in your spoon. So a slight tilt and a gentle approach paved the way to a cleaner lunch. The soup and filling were so rich, fatty and delicious (and far more soup than I'm used to), and the dumplings themselves more delicate than those I have encountered elsewhere. 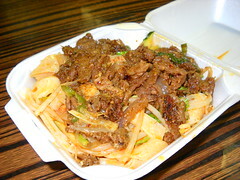 So where do the scallion pancakes with beef fit into this lunch? 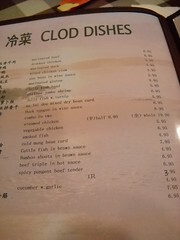 Well, let me say that they were hardly overshadowed by the soup dumplings, they were just that good. It was basically a long strip of fried dough, tri-folded like puff pastry, and filled with sliced beef, scallion and what tasted like a sweet hoisin sauce or a richer plum sauce. 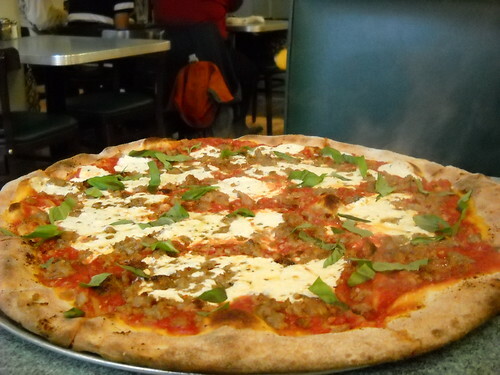 The dough was perfectly crispy, not the least bit greasy, and just so delicious - a perfect proportion of all ingredients. So when you visit Nan Xiang Xiao Long Bao, get the soup dumplings, but don't ignore the scallion pancake with beef. 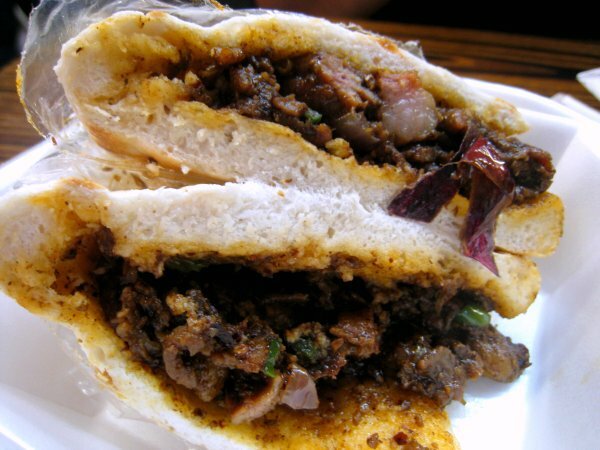 I tasted my $1 sandwich and it was as delicious as expected - a soft doughy bun (same style as Sun Wah), just the right amount of sauce and scallion, and some beautifully rich duck meat and a nice dose of crispy skin. I finished my first sandwich and knew I had to get another. But I will say this - if you've had the duck service at Sun Wah, I'm not sure I'd say this is better tasting, although perhaps the duck carving was a little cleaner. But $2 for 2 sandwiches left me glowing. Unfortunately, I wasn't quite ready for another bite of anything at the moment, and I knew I needed to make it through this day of feasting and be able to stand upright at the end of the day. But the wonderful aromas from this place convinced me to sample their fares on my next visit. On to the Golden Shopping Mall, let's first make sure you understand that the phrase "shopping mall" is used loosely. It was hard enough to find the entrance (on Main St. between Sanford and 41st Rd. but closest to 41st), and even harder to find the basement (entrance on 41st Rd). To describe it as dingy would probably be a compliment. And much of the stalls for eating are places I know I could never take my family or friends - they'd walk out in a New York minute. And assuming you find your way to the basement, make sure you know the number of the stall(s) you seek out because little English is written or spoken. And all of the stalls have rickety tables and are very crowded and warm. Watching the woman behind the counter hand pull the noodles was a treat. Tasting the noodles was even better. Spicy, sweet, savory, crunchy and then the noodles . . . a great chew. Then the cilantro, and the gluten pieces soaking up the flavors. What a revelation. It was just a perfect dish of flavors and some nice textures. From here I moved on to Sichuan Heaven (stall 31), where I ordered Dan Dan noodles. These I didn't love and it was because of the weird sensation the flavor gave my tongue. It wasn't that it was so spicy (I didn't think it was). And it had a nice herbal flavor. But I began to notice an icy cool sensation take over my tongue -- almost like Novocaine --and I have no idea why this happened or what it was. Perhaps too much sour, perhaps some herb that didn't agree with me. Flavors nice, noodles had a good bite, but I was not thrilled with the overall dish because of the weird tingly sensation which practically numbed my mouth. So on I went and as you can imagine, I'm getting really full. But onto the Flushing Mall for hand pulled noodles and shaved ice. Well, I never actually found room for the shaved ice, but I did find room for the noodles. Now let me say that the Flushing Mall was far more of what one might think of when they think shopping mall. And when you get there, head to the basement food court. There's another location of Xi'an Famous Foods, some Chinese-Korean counters, but I was there for the hand pulled noodles in soup (it's the restaurant at the very end by itself, as opposed to all of the others on the same single side, if that makes any sense). This soup was outstanding. It featured a very rich, meaty broth you so seldom find, and was lightly seasoned so that the meaty broth and noodle combination really shined. The noodles had such a terrific bite - as good as I've had. And it all just came together so well. All in all, a perfect day in Queens, even if I ate enough for 2 days in one 4-hour tour by myself. 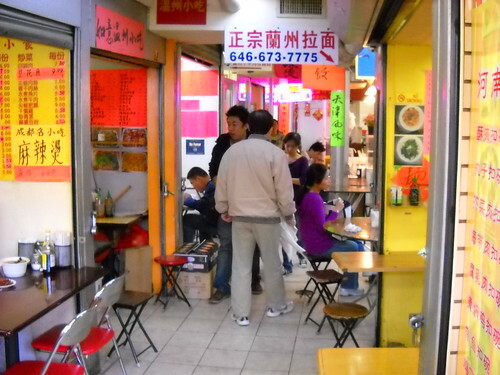 From here I moved on to Sichuan Heaven (stall 31), where I ordered Dan Dan noodles. These I didn't love and it was because of the weird sensation the flavor gave my tongue. It wasn't that it was so spicy (I didn't think it was). And it had a nice herbal flavor. But I began to notice an icy cool sensation take over my tongue -- almost like Novocaine --and I have no idea why this happened or what it was. I'm guessing that's the Sichuan pepper effect. If it was a fizzy numbing sensation that turned sour if you drank water, I'd say that's what it was. Sounds like it didn't slow you down much though Great pics of a great day! boudreaulicious wrote: I'm guessing that's the Sichuan pepper effect. If it was a fizzy numbing sensation that turned sour if you drank water, I'd say that's what it was. Sounds like it didn't slow you down much though Great pics of a great day! According to this Wikipedia entry, you're exactly correct that it was the Sichuan peppercorn . . . except it sounds like it may not have mattered that I drank water with the meal. Interestingly, I have cooked with these peppercorns and not experienced this numbing/freezing effect before, leading me to believe that the Sichuan peppercorns I have in my cupboard are of poor quality. And although I didn't really enjoy this numbing/freezing effect, I'm curious to try it in a dish again and see if it was the overly herby/medicinal flavor of the dish I did not enjoy, or if it was the numbing/freezing effect. Thanks for the help boudreaulicious. I find that a little bit of the Sichuan Peppercorn goes a long way. But I've liked it in other dishes, and not so much in Dan Dan noodles myself. Sonoma Howie and I, on our annual Food Marathon, are following the lead of Pigmon and Trixie-Pea: neighborhood Queens. I won't bore everyone with detailed reports on everything, but a couple of added remarks here and there might amuse. First, we searched and searched for the bloody Golden Mall, asking here and there. And then, duh! it finally occurred to thick Geo that there's a difference between "road" "street" and "avenue". That being cleared up, we found the warren immediately. Saturday evening, hottest day of the year. You cannot imagine what it was like in the warren. Ouf. But the lamb burgers, noodles, etc. were exactly as good as promised. We had a couple of other dishes, a "hot and numbing [yes, Sichuan peppercorns] lamb face", which pretty clearly was a chile-stewed jowl, hot, numbing, juicy and excellent--a cold dish, garnished with lots of cilantro. Then, to finish off, "lamb spine" which was a concoction utilizing the cleaned ribs and backbone of a small lamb. The project was to find the small pockets of flesh that had survived the butcher's filetting, and chew, tug, or snag them off the bone. Unimaginably messy, fat dripping down our chins, mixing with the sweat rolling off our brows [have I mentioned how HOT it was there??]. Incredibly tasty, those remnants, but I wouldn't do it again, unless I had a towel and washbasin to hand. Yesterday, we ventured into Manhattan, came up at 79th on our way to Zabar's only to discover that the downtown-pointing lane of Broadway had been turned into a street fair. 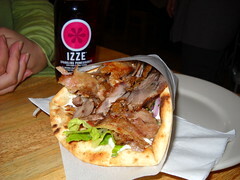 Gloriously thick clouds of roasted-meat smoke roiled all around us, from the myriad souvlaki, roast corn, sausage stalls. What a hoot! Stopped off at Artie's deli for a pastrami (decent enough) and a knishpuppy (two Artie's special hot dogs wrapped in a potato knish), which was simply inedible. Give it a miss, folks. BZ gyros, self-proclaimed "best gyros in New York", weren't lying: I am a Gyros Expert, having eaten them in about 10 countries, including all over Greece. 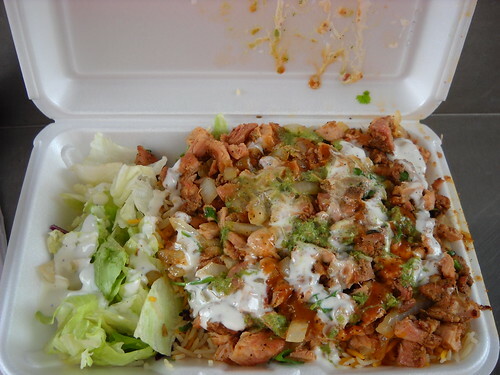 My best ever was a donor kebap from city hall in the Ehemaliger Ost-Berlin. It's *still* my best ever, but BZ is absolutely, without doubt, in a close second place. Yum. the Bohemian Hall and Beer Garden, NYC's only remaining beer garden, now celebrating its first century of existence. You cannot imagine that this place is in the US. Really. Maybe 1500 20-30-somethings sitting at long tables in the open court, many dancing to the mittel-europa orchestra, replete with violin, ah-core-deen, et al. Wow, what a place, what a crazy experience, what a line-up of Bavarian and Czech beers. Typical brauerei eats--wursts, schnitzels, etc.--great dark wood booths. Worth a detour. 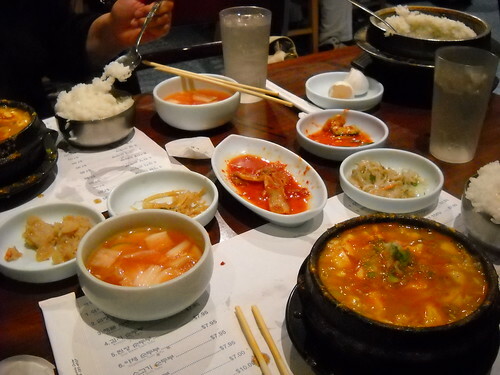 Today, probably some peruvian-korean fish, and some dumplings. Tnx soooo much to our predecessors in this adventure! Thank you all for the excellent info in this post. After landing at LGA this weekend, took the Q72 to Flushing right from the airport. 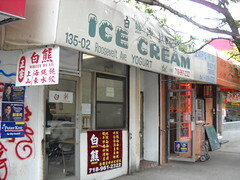 Hit up both Nan Xian and Corner 28. Those duck buns at Corner 28 really are exceptional, one of the best things I've eaten in NY. Nan Xian was excellent too, Flushing is definitely worth the trip when in NY. Benet, to summarize your post - the one thing that was described as below average you liked and you didn't like the photos of the cookies which are not on this post? I have read this thread three times now looking for a picture of a cookie, please tell me which cookie you think looks "unappetite". You "believe" the pizza is tasty, does that mean you have not actually had it? You're welcome. Glad you enjoyed. Note that Best North Dumpling has moved. 5. 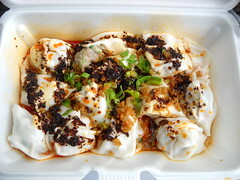 Xian Famous Foods in the Golden Mall (41-28 Main Street, stall #36, basement level) - hand pulled noodles with cumin lamb, cumin lamb burger, liang pi. 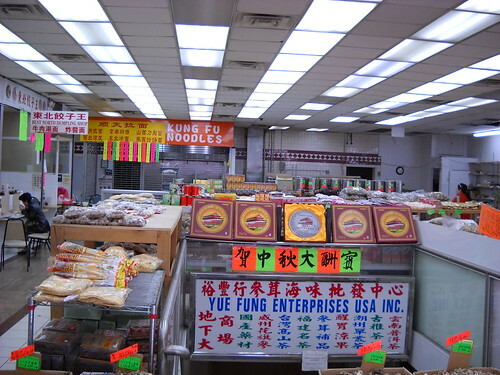 This one is skippable if you plan to go into Manhattan at some point as they have two Manhattan Chinatown locations and one East Village location now. I've done this tour, too, by cutting a few spots and either starting at Guang Zhou restaurant for dim sum or ending with Nan Xiang for xiao long bao. Serious Eats also has maps of the Golden Shopping Mall but some of the stalls have changed, since. 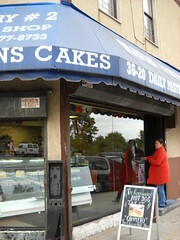 Golden Vietnam Bakery is now a baos/buns/scallion pancake/fried dumpling type of place. The bubble tea place is gone now. BTW, I'd skip Shandong Dumpling as the last batch we got was a bit burnt. These stalls change hands so quickly that any map is likely to go out of date in 6 months.